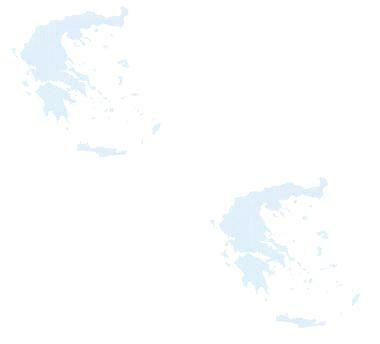 For a general map of Peloponisos, click here!(40K). For a map of the Laconia area, click on map above. 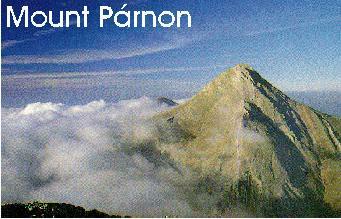 This village is the base for climbing the peak of Mount Parnon (1935 meters (about 6500 feet). 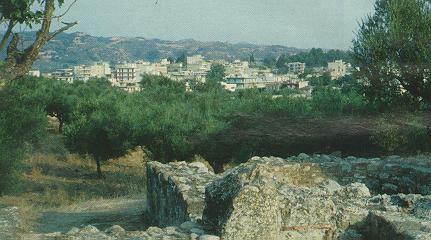 The capital of the Lakonia province and the city of the Ancient Spartans. Found nearby are the ruins of the Mystras, the gorge where sick children were thrown by the Spartans and the ascent to Mount Taygetos, 2407 meters(about 7000 feet). Near Spárta are also the ruins, some in very good condition, of Mystrás, the old Byzantian city established here in the turn of the millenium. A lovely village on the foothills of Taygetos, at an altitude of 800 meters (about 2500 feet) full of reaturants, tavernas and souvlakis. A beautiful village on Parnon Mountain, situated at a height of almost 1000 meters. The village celebrates the name day of Peter and Paul (Petros means Peter in Greek) on June 29. Nearby can be found the Convent of Malevi. This convent is famous for its catholic which was built in the beginning of the 17th century. In the 18th century it was used as a hiding place for 'thiefs' (which in this case means people with the kind of idealism that Robin Hood had). During the war of independence, it was used as a hospital. A lovely seaside village that has now been taken over by many houses, most of them for rent. The capital of the area and a lovely town built on reddish rocks. There is nice contrast between the rocks and white washed houses that abound. Here the old locals speak a special dialect called Tsakonika, which originates from the Dorians (400 BC). 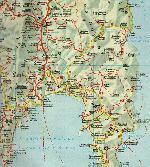 The seaside part is called Plaka and is 4 km away. About 15 km from Leonidio, built on an incredibly steep cliff, full of eagles nests, is found the Monastery of Elonas. It was built in the 16th century and became famous due to the treasures and richness of its artifacts. Village on Mount Parnon near spruce forests. Nearby (a one hour walk) is found the Gorge of Propantes. A village witness to the many types of civilisations that passed it. Neolithic, pre-Christian, Byzantine and Frankish. 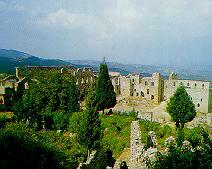 On top of a nearby hill are ruins of a Frankish Castle and within the town, many churches. The town is famous for its handweaved carpets and rugs. A village, the site of the ancient Yakinthia ceremonies in honor of god Yakintho. It was semi-detached from the Spartans and was used as a belief center for them. 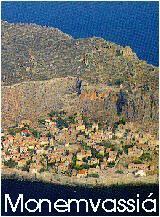 A nice, lonely village on the Myrtoan sea, half way site for jetfoil and ferry services from Pireaus to Monemvasia. Two nice pebble beaches are found nearby. A seaside port found within a small fjord, bounded by steep cliffs. Inside this fjord are a salt lake, and the actual village. Due to the restricted passage, only small ferries can enter and the ones that do, have trouble turning due to the narrow passages. One of the two most important Byzantine sites, the other being Mystras (see above), built on a steep rock, that looks like a miniature Gibraltar. Now it has become a place of expensive hotels and immeasurable restaurants and tavernas. One of the nicest and cleanest beaches of the area, with warm crystal clear waters. A wonderful island, full of pine and cedar trees, taverns and many small hotels and rooms to rent, named after deer that was supposed to have lived here in the past. Sandy beaches abound as well as preponderance of tourists. Small ferry boats reach it from the mainland as well as a weekly ferry from Pireaus on its way to Crete. The main town of the area and the main link between the mainland and the islands of Elafonisos, Kythira and Antikithira. video for 28.8K modems and up. 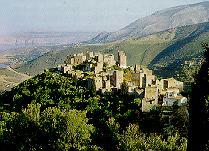 A nice village situated up a mountain, very near to Cape Maleas. Also found here is the Church of Agios Nikolaos from where there are incredible vistas. 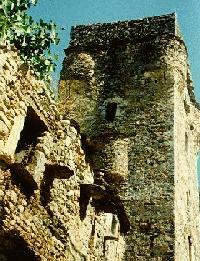 A view of a typical Mani tower, such as the one owned by the Clans that roamed the desolate landscapes years ago. For more info on Mani, click here. or Towers in Mani for 28.8K modems and up. The capital of the area and the door into the Mani Peninsula. 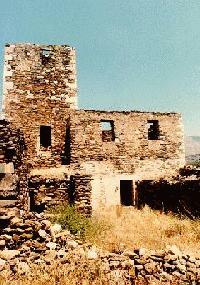 Mani was in the past an area of autonomous control even during the Ottoman occupation. 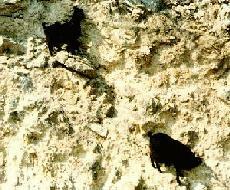 The Ottoman Turks never had interest in entering because it was very difficult to get around and very barren. 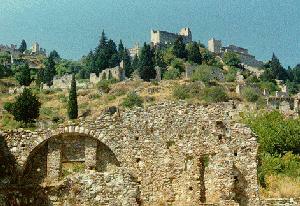 This way, the Mani became the only place in Greece where very few things got passed by the marrauding armies. The Mani society was based around clans who fought one another for control. Although violence has given way to more civilized means of argument, the clans exist today. Base of the clan was the tower, a tall bulding with small windows to give litle open aim to attackers. 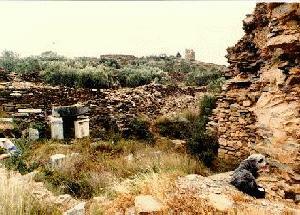 Many of these towers abound today and some have been converted as guesthouses (see VATHIA below). The main market road in Areopolis, Mani. For more info on Mani, click here. The real heart of Mani and the capital of the area. 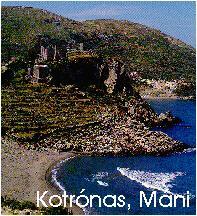 Situated here are churches, kalderimia (stoneways) and mani towers. Nearby is Limeni, its port where the Mavromihali tower has been turned into a museum. Also nearby are two churches that have frescos dating back to the 12 century (need keys to get in). A view of the upper Mani and the village of Itilo. For more info on Mani, click here. Itilo/Mani for 28.8K and up. 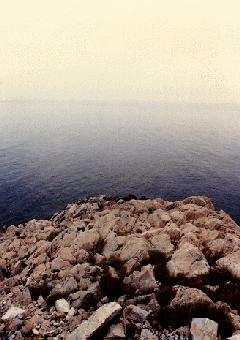 The site of the famous cave of the same name, which is rumoured to reach out to the mediterranean sea. Found after a lamb fell into a fox hole, it contains subterranean rivers, stalactites and stalagmites, and is well worth a look. The visit, on a boat, takes 45 minutes. Once a month a small group is taken to explore its entire length of 6 km/4 miles. A vilage built on the edge of a cliff, protected by a small promontory in the shape of a hand. A hand in French is called a Main (pronounced 'maen') and it seems that the origin of the word MANI comes from William Villardouaen who built a castle there and called the area from the shape of this promontory. Nearby is also a wonderful church, dedicated to Agía Várvara, dating back to the 10th century, still in good condition with beautiful frescos. The church is kept closed but a pictorial description is available here (a total of 160K worth of photo data). A small village with many well kept churches, near the site of the 5th century Agios Georgos (St. George) church, ruins of which are in evidence. 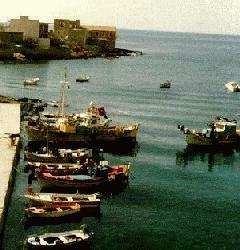 A view of the beautiful port of Gerolimena, deep Mani, Laconia. For more info on Mani, click here. Gerolimena/Mani, for 28.8K and up. with the use of small caiques or boats. It is with a small boat that one can sea the cave of Hades, the entrance to the underworld, according to Greek Mythology. A view of Deep Mani and Vathia. With Theodorakis's music in the background. For more info on Mani, click here. Mani / Vathia for 28.8K modems and up. A very typical Mani village still kept completely in Mani style where all the houses are three of two floor towers and most of them available for rent through EOT. Near Vathia, there is a lovely small beach with clear but cold waters. The last small port in Mani and the start of the long walk to Cape Tenaro(3 hours). There are two tavernas here. The Southermost part of the Peloponese, and since 1988, the site of an automatic lighthouse. On the way to the Cape, the walk passes over some ruins with lovely mosaics. Absolutely beautiful views of the whole area, especially in summer when the weather is tranquil and warm. The biggest and most touristy seaside village in the eastern Mani, southfacing, protected from the North winds. 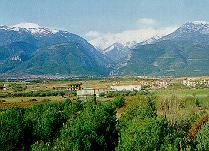 Directly west, over the mountain Saggias, is Pirgos Dirou.